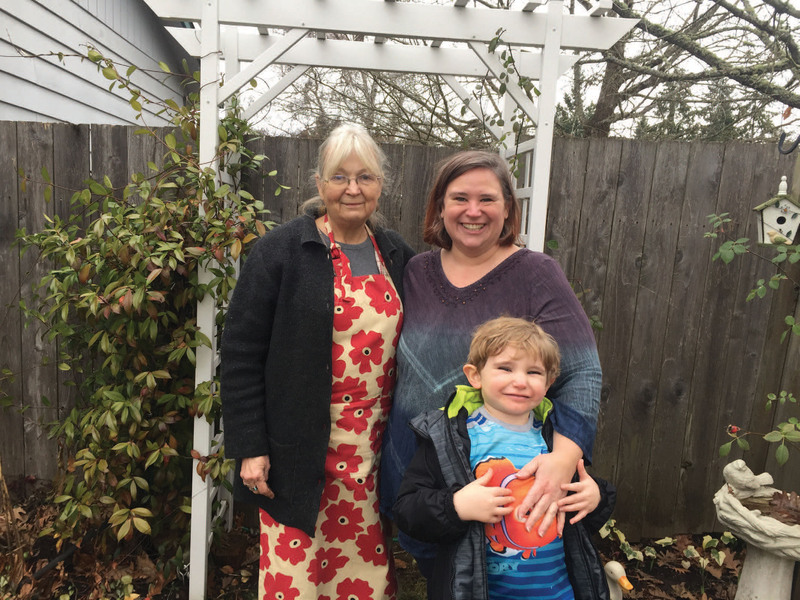 Bobbi Hall, left, board of director, and Brandy Collier, founder of Eugene Area Gleaners, with Collier’s son Ryder. Eugene Area Gleaners has grown to 708 members in 10 years. Brandy Collier never envisioned gleaning—gathering leftover food—to be part of her day-to-day routine. She grew up in a middle-class family where food was in abundance at their home. Around 2008, she was laid off from her job of nine years. The practice of gleaning was the only thing providing her and her daughter with food security. Brandy struggled in abusive relationships, and maxed out her credit card moving herself and her daughter into a new apartment where she went through flaky roommates—all while putting herself through school. She was introduced to gleaning through a friend. Together, they knocked on doors asking residents if they could pick fruit from their trees. The concept of gleaning has roots as far back as the Old Testament, when Hebrew farmers were commanded to leave a portion of their crops unharvested for their poorer neighbors and strangers to pick what was left. In recent times, the practice has been used by many to curb food waste. In 2008, Brandy helped found the Eugene Area Gleaners. The group became a nonprofit in 2015, and has since grown to 708 members—33 of which are glean leaders and six are board directors. Although most gleaners identify as female, gleaning is practiced by all genders, ages, ethnicities and income levels. Bobbi Hall, a board director of Eugene Area Gleaners, is in charge of drop sites, which are volunteer homes with porches or covered structures. She first started gleaning around 40 years ago to help feed her five children. 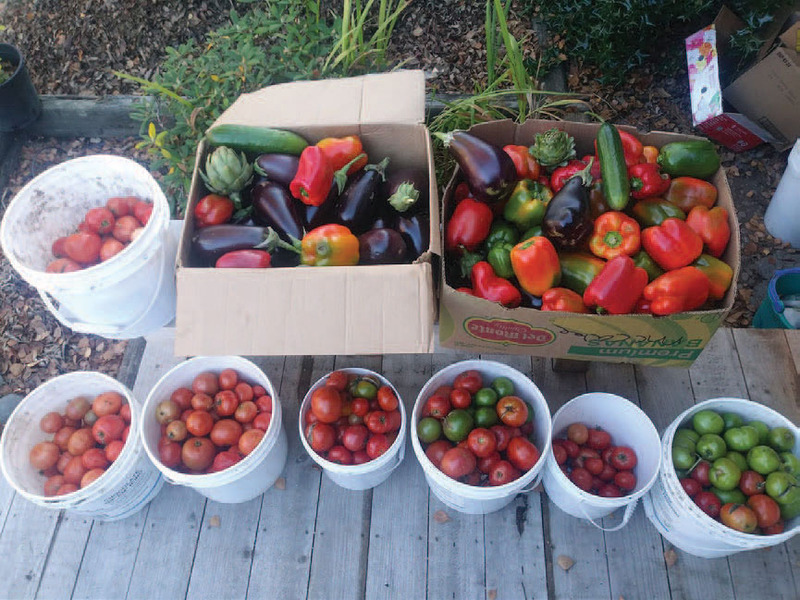 Now that she is retired with a fixed income and extra time, Bobbi uses gleaning to supplement her food budget. Buckets of gleaned vegetables are placed at drop sites where members of the Eugene Area Gleaners can pick up what they need to feed their families. As of November 10, 140 gleans occurred in Eugene last year. The group collected and distributed 49,000 pounds of produce that otherwise would have gone to waste. Brandy says 2018 was a slower year. The season kicks off in May or June, and continues into the winter—it’s gleaning time whenever donors call. Brandy says their group runs on word of mouth and repeat donors. For example, Winco donates its extra inventory of bread each week. Eugene Area Gleaners does not have a brick-and-mortar establishment, as it is completely volunteer-run. The food is stored at the drop sites and distributed among the group. That one thing could be anything from hanging a flyer to being on the board of directors. Gleaning goes beyond fruit. Egg farmers donate eggs and chickens once they stop laying. Brandy has set up partnerships with the Oregon Department of Fish and Wildlife, and the group has learned to glean bear meat and carp. Despite being an established nonprofit for a decade, Eugene Area Gleaners still faces many challenges. Between work schedules, transportation, physical ability and child care, Bobbi says there is a lot of work that goes on behind the scenes that the average gleaner never sees. Along with organizing each glean, the nonprofit status also requires more documenting and reporting. For all events the group participates in, Eugene Area Gleaners has a Facebook page and group, as well as Twitter and Instagram accounts. Outside of management, the organization deals with the same struggle of most nonprofits: lack of funding. Eugene Area Gleaners is starting to be recognized for its efforts. Brandy was chosen by The Register-Guard and Lane County United Way Committee as Volunteer of the Month for December 2018. Along with being featured in an article, the gleaners received $500. For more information visit the Eugene Area Gleaners website.